Throughout the ages, peoples of all faiths and cultures have believed and benefited from the use of different types of good luck charms, lucky symbols, amulets and talismans. But do they actually work? In a word - yes! Human beings are not just matter: we have incredible potential in the form of spiritual energy. What we call "intuition", "fortune", "drive","ambition",even "intelligence" (or "emotional intelligence") is nothing else than our own inner strength, or spiritual energy, manifesting itself into this material world. Talismans aid us in channeling all that amazing potential, all those good thoughts and intentions, into our physical world. They are not just another pretty piece of jewelry! They are perfect as a meaningful gift for a dear one and yourself. 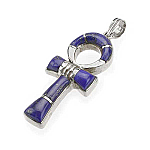 Expertly crafted in 950 Sterling Silver with inlaid Lapis Lazuli and Turquoise, this exquisite Mandala Cross represents the sacred circle filled with a cross, considered by many as their main symbol for transmitting the energy of the God. The Sacred Earth symbol, also called the quartered circle, represents the sacred circle filled with a cross, four equal lines pointing from the center to the spirits of the north, east, south, and west -- or to the basic element: earth, water, air (or wind), and fire. It brings balance and healthy perspective to one's life. A beautiful way to wear your favorite Bind Rune! This sizable signet ring is handcrafted in 950 Sterling Silver with face inlaid with Lapis Lazuli, malachite and turquoise representing the runic symbol.